A- loves being read to. She picks up new words and ideas from the books we read, requests both favourites and new books again and again, and can identify objects in photographs and drawings. I borrowed a few children’s books from the library in case reading about upcoming changes or challenges helps her understand. The books were okay, but didn’t quite fit the words we use or the way we like to handle things. So this week, I decided to make my own books for A-, especially since there are few books that cover things like microphthalmia. I read the new book to A-. She asked me to reread it several times. She pointed to the book and said, “A-!” She pointed to the stick figure for me and said, “Mama!” Success! She’s starting to echo phrases from the to books, and it’s been only a few days. Wow! I’m working on a third book now. Time for something fun: “Let’s Make a Smoothie,” since she enjoys making and drinking them. She already knows all the words, so this is more about enjoyment. This time, I’m going to make a workflow that lets me draw on two-page spreads. I don’t have any wide drawings planned yet, but it could be handy for later. I made an Inkscape template to help me keep margins in mind. I learned how to use Medibang Paint’s folders to organize all the layers, and I’m getting the hang of digitally tracing and painting the photos I took. Over several nursing sessions, I flipped through all 750+ of my sketches from 2016 on my phone. It was a quick and wonderful overview of the past year. It’s amazing to see how much ground we’d covered one day at a time. 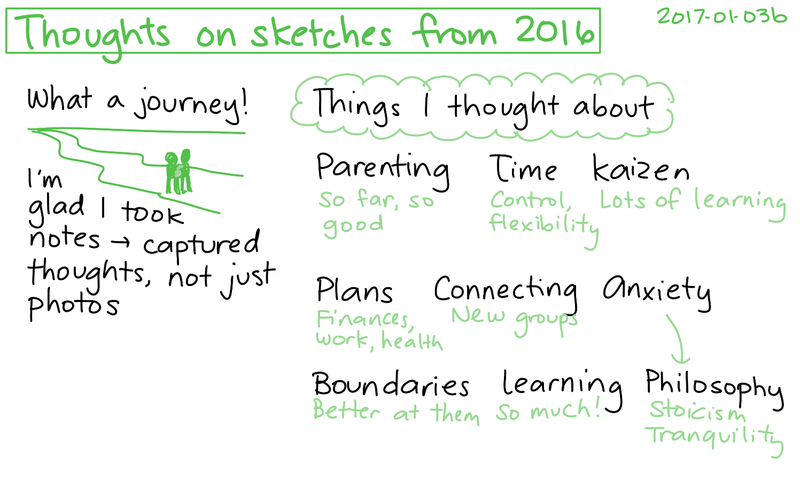 Taking 5-10 minutes at night to draw a visual journal worked out well. It was my second year with daily/weekly/monthly sketches, and my workflow held up to the demands of caring for a newborn. Some nights I fell asleep before A- let me sneak away, but the text notes I jotted throughout the day helped me reconstruct events even after several nights. I really liked having a record not just of what happened, but also what I was thinking about, and the little moments that would have been hard to capture in a picture. When we were dealing with lots of uncertainty, thinking out loud helped me untangle my thoughts and feel like things were manageable. Looking back over the past year, I think I like the person I was and the person I’ve grown to be. I didn’t have much time or energy to dress up my sketches or go beyond a simple style. It was nice to see the sketches I spent some time colouring for presentation, though, and the drawing practice I occasionally indulged in. My copies of characters from the books I read to A- reminded me of those stories, and rough sketches of her (mostly sleeping, since that was the only time I could draw from life) made me smile. I think I’d like to make more time for drawing, not just capturing thoughts. I found it easy to go through my sketches and remember what it was like at that point in time. Sometimes I wasn’t sure what a cryptic note on my sketch meant, especially if I didn’t cover it in my weekly review, but that’s okay. I still haven’t finished my yearly review, but having all those weekly and monthly sketches sure made the process easier. Onward! 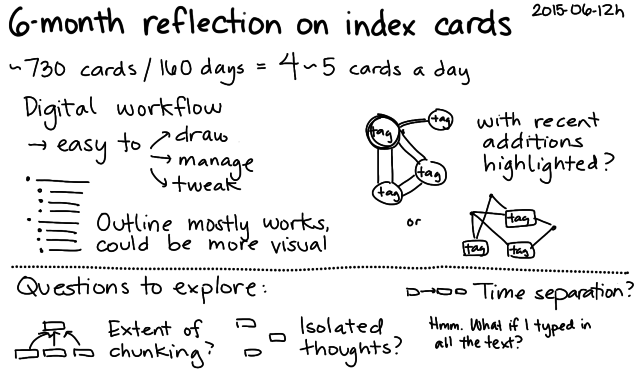 In 2015, I built the habit of drawing daily index-card-sized thoughts. Some days, I reached (or blew past!) my target of five index cards a day. 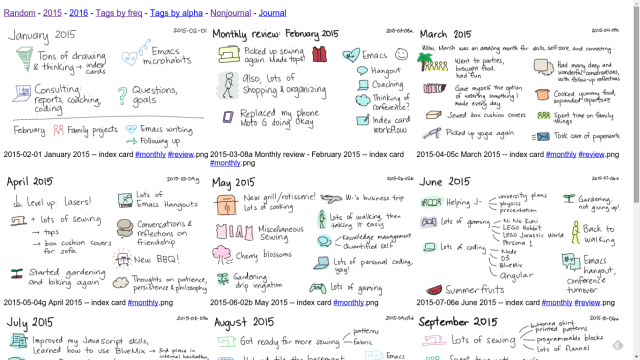 Other days, I backfilled my daily journal entries based on fuzzy memories and my time logs. 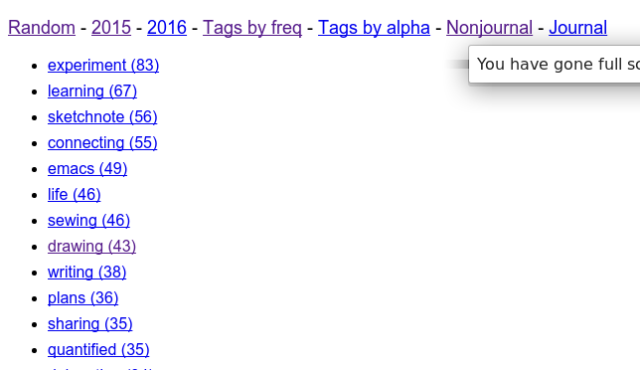 In February 2015, I started using a yyyy-mm-dd<letter> naming convention so that I could easily refer to individual cards. 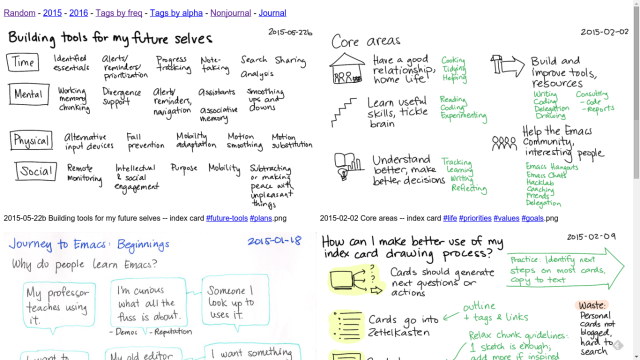 For a while, I tried to be fairly disciplined about organizing sketches into outlines and building up chunks into blog posts. That fell by the wayside when I found it difficult to concentrate, but I kept drawing anyway. I saved the images to my hard drive, started tagging them with keywords in the filenames, and uploaded my sketches to Flickr as a way to back up and share my files. I’ve recently been exploring ways to take advantage of the Samsung tablet that W- bought some time ago. It works wonderfully as a second screen that I can use to review an old sketch while I draw another one. The FlickFolio app lets me do a random slideshow of the past 2000 images in my photostream or in an album. 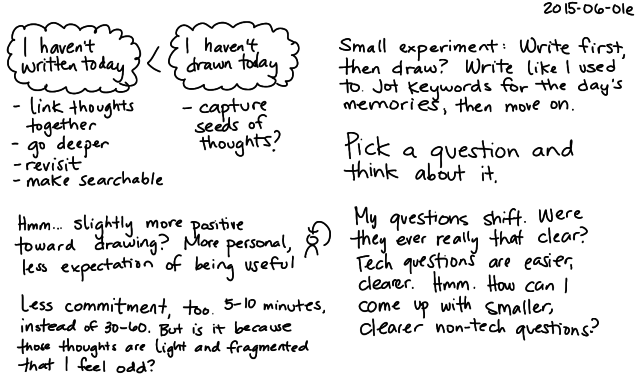 This turns out to be an excellent way to jog my memory and prompt me to revisit questions or decisions. Now those fragmented thoughts are starting to pay off. Many of my old index cards are on topics I haven’t thought about in a while. It’s fun to see what I’ve learned in the meantime, or to follow up on things I’ve forgotten. It’s like I’d been filling an idea pipeline or seeding an idea garden. 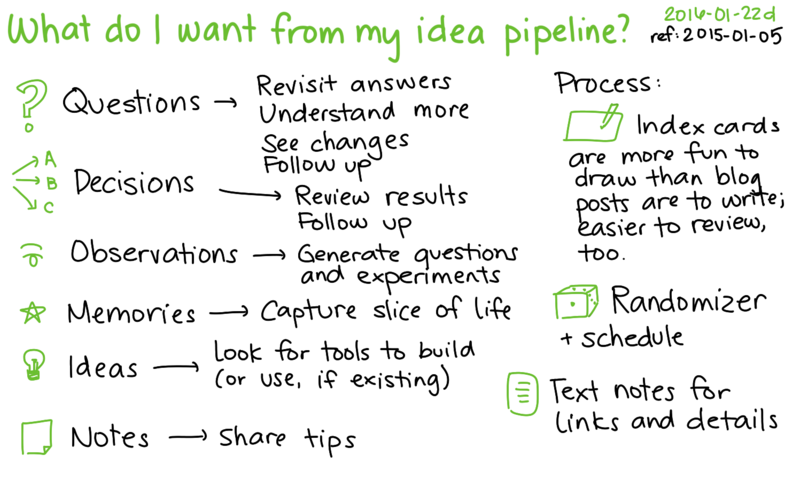 I get this steady stream of questions, decisions, observations, memories, ideas, and notes, and I can build on those prompts instead of having to start from scratch. I want these index cards to help me shuffle ideas and possibly see serendipitous combinations. 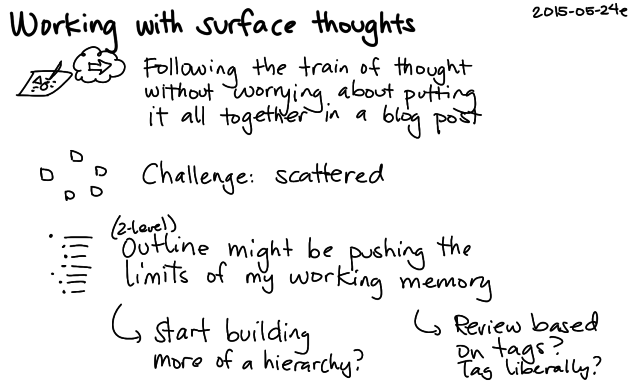 They’re small, so capturing thoughts on them doesn’t require as much effort as, say, writing a blog post. 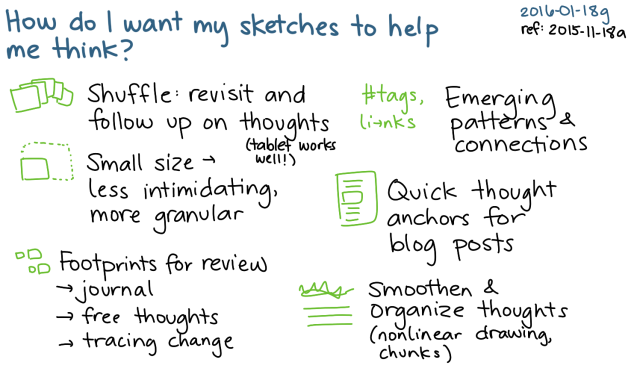 They’re a good way to smooth out and organize thoughts, and I can chunk up those thoughts into longer posts. 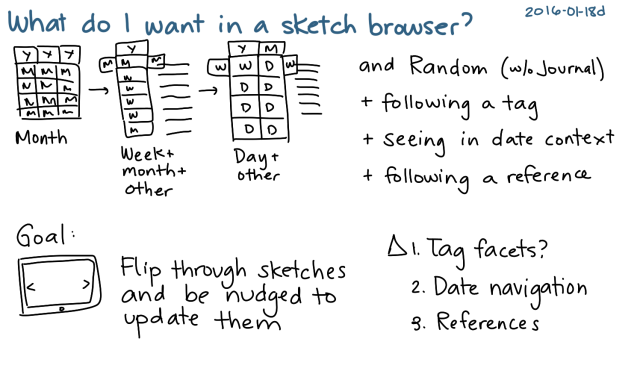 The sketches are easy to review, too, so they work well as digital footprints. 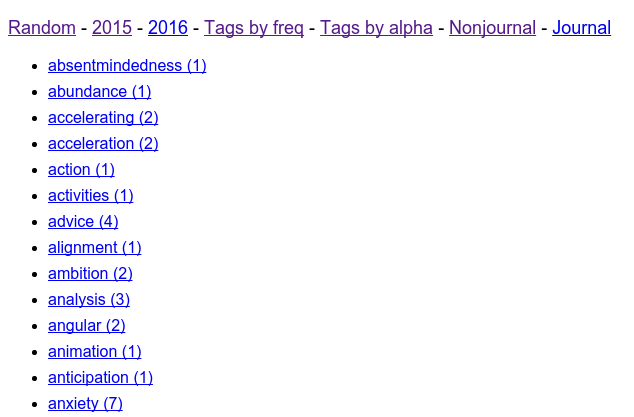 I re-read the year’s blog posts as part of my annual review and sometimes I reread my posts on a monthly basis as well, but it’s not as immediate or as wide-ranging as flipping through a random selection of images. A random slideshow is a good start, but I’ve been meaning to make a sketch browser that’s a little more tuned to what I want. I wrote a simple NodeJS server that I can run on my laptop and access from the tablet (or other devices) while I’m on my home network. At first, I was trying to figure out an interface that would let me navigate by month/week/day, but then I realized that something simpler might be a more useful way to begin. Here’s the script on Github, in case you’re curious or you want to build on the idea. Some days it’s hard to hold a single thought and dive deeper into it. Sometimes it’s because I get distracted by other shiny thoughts. Sometimes my interest peters out. Sometimes I bump into the limit of what I can think about on my own, without experiments or research. 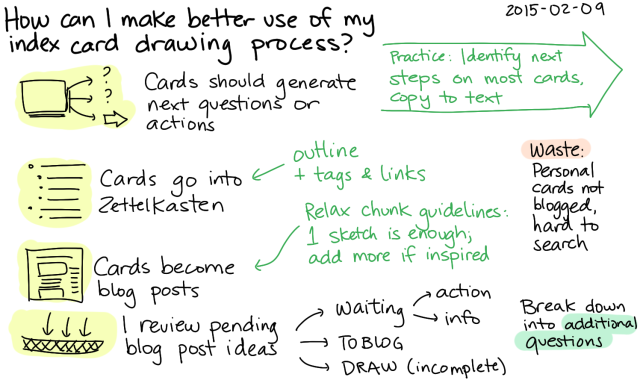 I’ve come to really like the way index cards let me capture ideas that aren’t quite blog-post-sized. 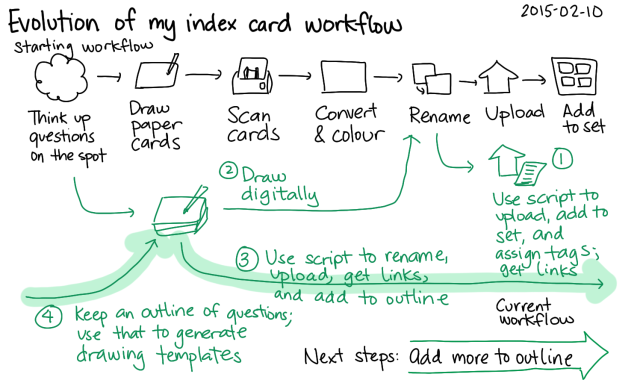 Technically, I haven’t drawn a physical index card since early February, but the digital index cards I draw are calibrated to that scale. 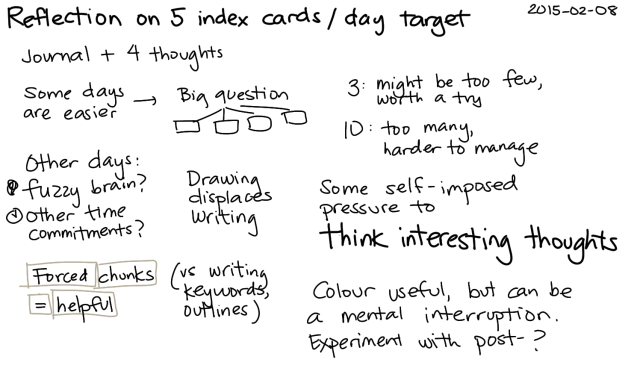 Still, some days it takes me a really long time to draw five index cards. I catch myself wondering if I’ve picked a good question. Sometimes it takes a while to find the next step in the thought. Sometimes it’s easier to let my attention drift to other things. On the other hand, there are some days when my mind is overflowing with little thoughts. It’s pretty easy for me to switch to another index card, scribble down part of a thought, and then come back to it later. I’ve been figuring out a better way to work with fragmented thoughts. I tried flipping my habit by writing before drawing. Sometimes that’s a good way to clear my backlog, but sometimes it means I don’t get around to drawing. Lately I’ve been experimenting with quickly capturing text fragments – a chunk even smaller than index cards. A few taps on my phone bring up a single-line prompt. Whatever I type into that dialog gets saved to a timestamped file named something like yyyy-mm-dd hh.mm timestamp - keyword.txt, and that’s synchronized over Dropbox to my computer. I have some code in Emacs to read those files and add them to a date-based outline, and I’ve included the code at the end of this blog post just in case it’s handy. I’ve found myself capturing more and more of these snippets these days. When a possibly interesting thought occurs to me while I’m walking around, it’s easy enough to take a moment to unlock my phone and add a note. My Emacs-based workflow fits me a bit better than the Evernote-based one I used to use, but that’s the benefit of customization. There’s still the challenge of bringing those thoughts together, of course. The text titles and fragment keywords are often enough to remind me of what I was thinking and how the different thoughts might be connected to each other, and I can always open the sketches in a new window if I want to refer to them. I have an ever-growing outline of sketches that haven’t yet been chunked into blog posts, and now I have a chronological tree of these little fragments. 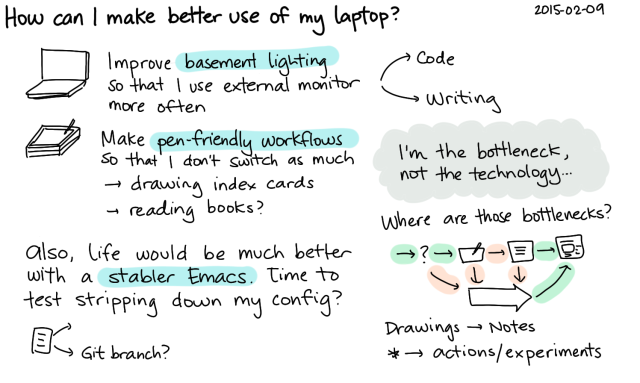 I have another bit of Emacs Lisp that lets me quickly get a montage of the sketches listed in part of my outline. Maybe I could use that more often – perhaps even randomly picking an outline node, coming up with a montage, and prompting me to either glue the chunks together into a blog post or draw whatever’s missing. and then the text fragments feed into the beginning of that thinking process. 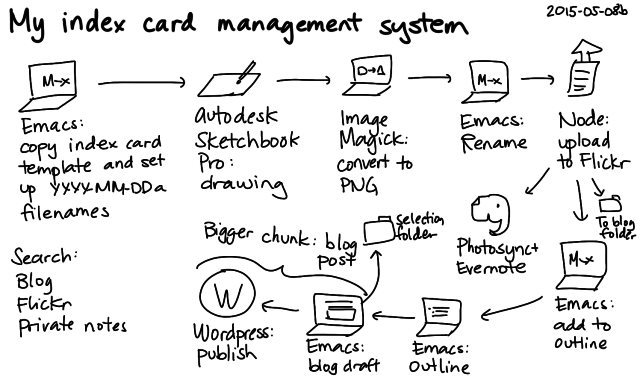 It’s been almost six months of thinking with index cards. I sometimes feel pretty fragmented, but there are confounding factors so I don’t know whether that’s a side-effect of this way of thinking. But I think it’s unlikely that my past self was that much more coherent and better at concentrating. Remembering what it was like to write my notes before and what it’s like to write my notes now, I think I like this way a lot. I feel like I’m getting better at writing about the small things, not just the big things, and I’m gradually getting better at tying things together. What might be some interesting next steps for this system? 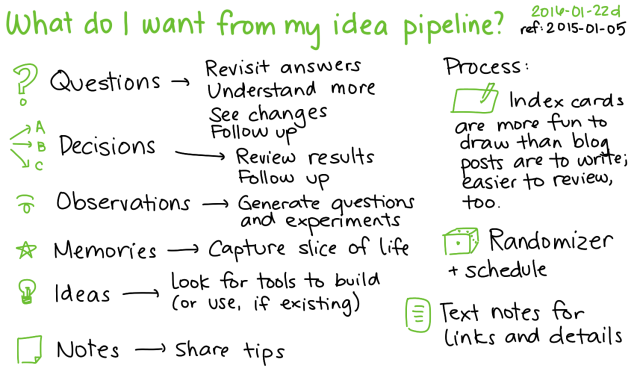 It might be cool to visualize how much has been chunked and what’s still isolated, in a way that’s more engaging than my outline. I’m also curious about the time separation of thoughts. For example, this post brings together four cards spread over a little more than a month, a set of connections I probably wouldn’t have been able to follow without these notes. "Copy phone data to a summary Org file."